"U.P. Power!" is no longer on display, but it was originally showcased from October, 2012 through March, 2013 in the Beaumier Heritage Center at Northern Michigan University in Marquette, MI. Dan Truckey, Director at the Beaumier Heritage Center, put together the original exhibit, and with Dan's help, UPSHF has compiled materials from that exhibit and adapted them for this website. We hope you enjoy it! As background on the original exhibit, here's a short video produced by local news while the exhibit was still on display at NMU. I'll never forget when I first heard that chant. It was at the 1982 Class D State Championship Basketball game between Covert and Ewen-Trout Creek in Ann Arbor. 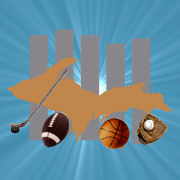 As the Panthers tried to come back against great odds against that powerful team from the southern Lower Peninsula, fans from throughout the U.P. in atten­dance started to yell, "U.P. Power!" I heartedly began chanting along, full of a pride in not only the place I came from but in being part of something greater than myself.